You’re welcome! That’ll be $30,000. Businesses trying to sell outside the United States, using forms built by developers who aren’t aware there is an “outside the United States”. So the postal code’s limited to five characters. Or when I select my country, the form still makes me choose from one of the fifty states (or, if it’s feeling generous, Puerto Rico and Guam as well). Forms that step me through a “convenient” eighty-step process, with no clue as to how far we are from the end. If I’m finally filling in my credit card details, and the children look noticeably older than when I first clicked the checkout button, I’m out of here. Okay, folks, I need a quick bit of help. The cartoon that ran yesterday on ReadWriteWeb actually originally had a different caption. And while I’m pretty pleased with the one it ran with, I can’t shake the question of which one is better. I put this question to the Twitters, and the suggestion came back, “Crowdsource it!” Sounds like fun, thought I, and so here we all are. Mind helping me out? Here are the nice people from SurveyMonkey to ask you to vote for your favourite. If I’m sounding a little more breathless, a touch more excited, a wee bit more giddy than you usually find me, well, there’s a reason. If you haven’t heard of Getting Things Done – or, as author David Allen’s fans call it, GTD – and you’re hoping to raise your personal productivity, then definitely check out the blog and look into GTD. 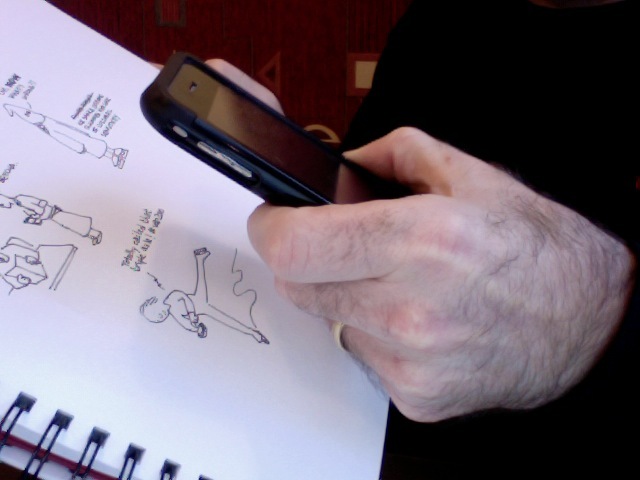 I just finished two days of iPad-based cartoon-blogging and doodle-note-taking at Northern Voice, the Vancouver-based personal social media conference… and boy, are my arms tired. But both the iPad and the Pogo Sketch performed magnificently. As for me, well, I’ll leave that to you to judge. Thanks, Northern Voice MooseCampers! published on May 7, 2010 Read more posts by the author of Thanks, Northern Voice MooseCampers!, rob2 Comments on Thanks, Northern Voice MooseCampers! I got to kick off MooseCamp – the narrowly-rescued unconference stream at Northern Voice – with a half-hour on webcomics. I shared a little of what I’ve learned over the past few years, but one of the things that grabbed people’s imagination is that you can cartoon without, well, cartooning. And then there’s xkcd – stick-figure cartoons from someone who every once in a while proves he can, in fact, draw pretty damn nicely. Thanks, everyone – I loved the session! Enough people liked the Drupal pickup line cartoon that I’ve created a mug on Zazzle. And thanks for the great response, people! And now a word about Bad Machinery. I loved John Allison‘s hilarious Scary-Go-Round, which tracked the lives of several 20-somethings, teenagers and occasional monsters in the supernaturally-charged town of Tackleford, England. (I felt bereft on reading the last page in the same way that I do when a beloved TV series winds up, or a good friend moves to North Vancouver.) The characters were often blithely aloof to the world around them, but as with Seinfeld, that somehow made them all the more human – especially on those occasions when their awareness allowed a little compassion to creep in. The fact that the more-or-less-lead character dies two or three times over the course of the comic is just gravy. His follow-up comic is Bad Machinery, and the characters include many of the younger siblings of SGR regulars and their friends. Now centered in the children’s school, Bad Machinery nonetheless has a more mature and humane sensibility to it. The occasional appearance from an SGR cast member – including one who has, for reasons not explained in the comic, returned from Hell – is an added treat, but you can start reading with zero knowledge of SGR and still enjoy it all immensely. But by all means, check out SGR, too. It’s a ton of fun, and it’s also a chance to see an artist’s storytelling ability grow along with his technical skills. Therefore, and notwithstanding the generality of the foregoing, I make you this promise: the day we top 500, I’ll be celebrating with a rare, almost-unheard-of triple update. That’s right: three N2S cartoons inside of 24 hours. So if you haven’t joined already, how about becoming a fan?